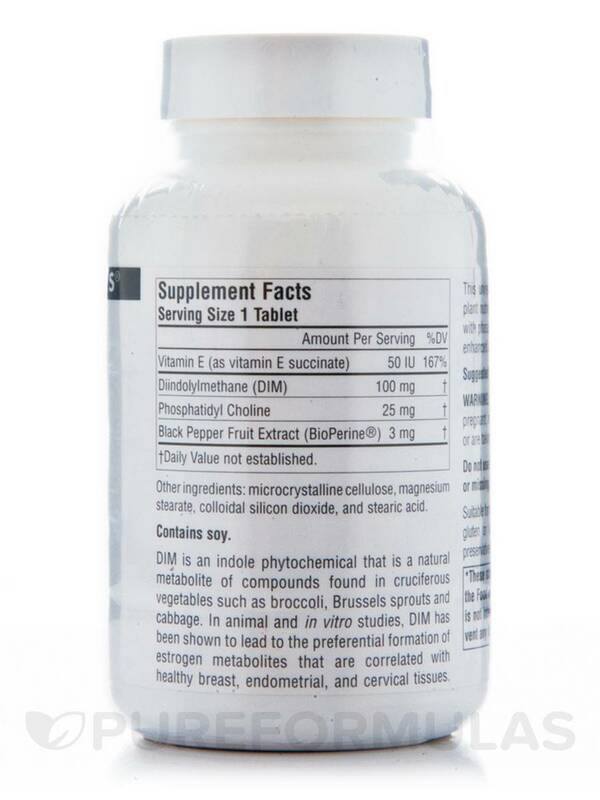 DIM is an indole phytochemical that is a natural metabolite of compounds found in cruciferous vegetables such as broccoli‚ Brussels sprouts and cabbage. 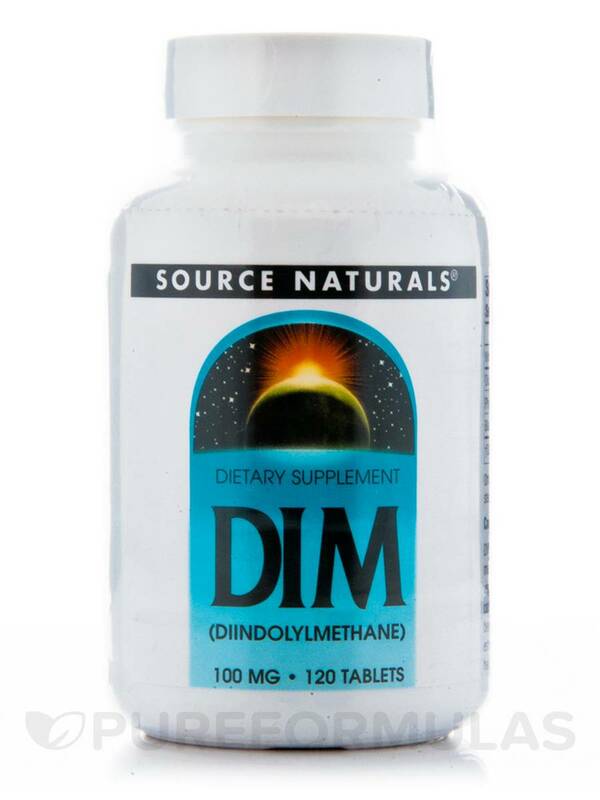 In animal and in vitro studies‚ DIM has been shown to lead to the preferential formation of estrogen metabolites that are correlated with healthy breast‚ endometrial‚ and cervical tissues. This unique property sets DIM apart from other plant nutrients. Source Naturals DIM is combined with phospholipids‚ vitamin E and BioPerine® for enhanced absorption. Microcrystalline cellulose‚ magnesium stearate‚ colloidal silicon dioxide‚ and stearic acid. 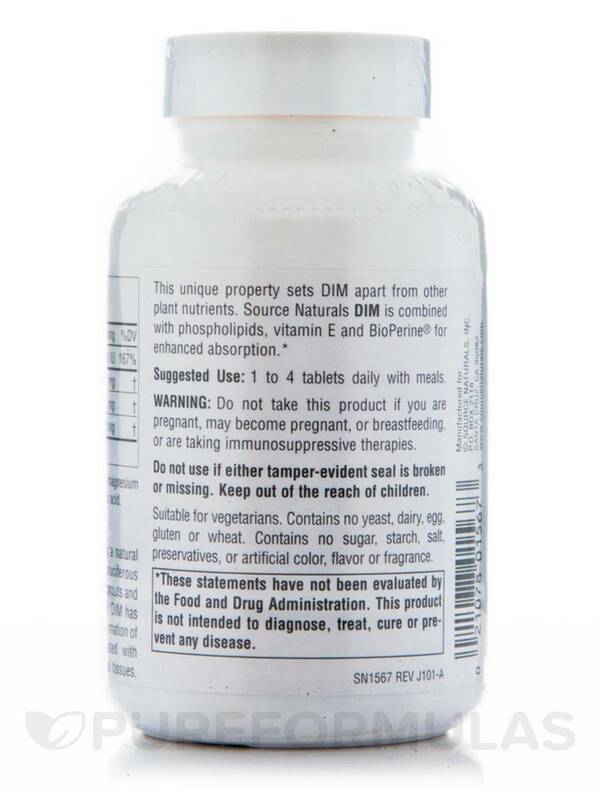 Do not take this product if you are pregnant‚ may become pregnant‚ or breastfeeding‚ or are taking immunosuppressive therapies.Do not use if either tamper-evident seal is broken or missing. Keep out of the reach of children.Contains soy.Suitable for vegetarians. I have tried several brands of DIM and this one is one of the best in terms of benefits. I usually notice the effects within half an hour of taking it. It has greatly reduced my PMS symptoms such s bloating moodiness hunger and cravings for sweet and fatty foods. It also had greatly improved my mood and my attitude towards things Im usually happy and careless when I take it. I gave it four stars because it started to make me dizzy after several weeks of taking it - I believe that was due to high doses of vitamin E in the product which is a vasodialator and can lower blood pressure (but that is just my theory). I had to stop taking it regularly and switch to a different brand. I still take it on occasion but I wish the dosage of vitamin E per pill was lower in this product so that I could continue taking it as it made me feel wonderful other then the dizziness.